The CM 2400 insulation machine is a perfect solution for contractors who need the flexibility to perform small jobs and commercial applications. With 3600 lbs 120 bags per hour you will have greater production rate way forward to your success. Hence it also require very little power on production circle. With its simple design specs and compressed maintenance capabilities the machine gives you an edge towards production rate. I bought a CM2400 about 8 months ago and absolutely love it. We have blown nearly 5000 bags of insulation with that machine and it has performed perfectly. The machine is well constructed and powerful and with the black paint and flames it looks, well, cool Also, Barry, you have been wonderful to work with, keep up the good work. This is the quietest insulation machine I have ever heard. For the size of my pole barn (2,500 square feet insulated to R-38 in less than one hour). I was amazed at how quickly this machine finished the job. I love this machine! I am going to sell all 6 of my (another brand) and replace them with the CM2400! The CM2400 works EXACTLY as described! Barry has been very attentive and knowledgeable in setting up our CM2400 for wall spray. He follows up immediately and we appreciate it. In South Carolina, This customer uses a CM2400 for attic, dense packing and wall spray. This long-time customer of Cool Machines gives his thoughts on the CM2400, Vacuum and service. 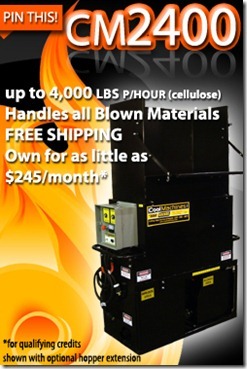 A customer in Mexico needed a fireproofing machine to apply cellulose to industrial boiler systems. We provided on-site training for Conejo Valley Heating and Cooling. Here is their testimonial. Positive Displacement Blower A Positive Displacement blower, aka Roots, provides a consistent, powerful stream. CM2400s now come with an airlock gauge. Before 2010, they lacked an airlock gauge. This video shows how to add one. This video shows a neglected CM2400 being serviced. Even with the abuse, this machine still works well and required only minimal maintenance. Hopper Extension: 30 cu/ft (6 bags cellulose) with up to 40 cu/ft. custom-made (8 bags cellulose or 1.5 bag fiberglass). 150 ft. remote cord w/cord hanger, offers convenient handling of remote device. Slow speed positive feed scalping augers extend component life while increasing safety. Modular design with see-thru access panels for quick troubleshooting and maintenance. #50 roller chain and hardened sprockets are rugged, corrosion resistant and positive driving. High quality powder coating provides a long lasting corrosion resistant finish. Stainless slide gate control provides precise control of fiber. Up to 40 cu./ft. hopper capacity fiber storage. High speed stainless shredder maximizes fiber conditioning coverage and production. 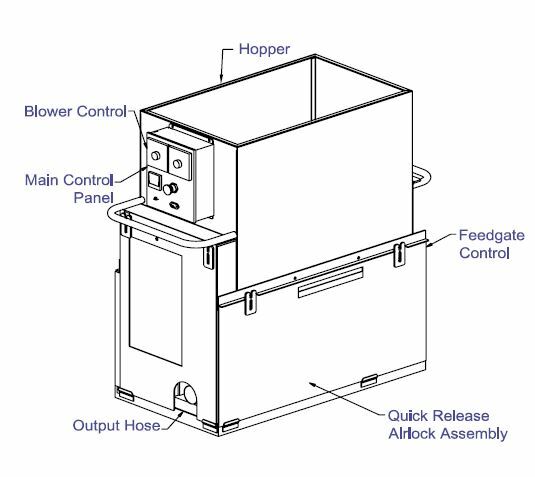 Large 12 x 12 and 12 x 16 quick release airlock is a durable easily serviced component. Safety Features: kill switch and manual controls promote increased operator safety and quick hazard response. Manual thermal overload protection of all motors and electrical components. Deluxe voltmeter for quick electrical diagnostics. Even though our machines come standard with a 150 3 way remote. If you want the instantaneous control of your machine with over 500 of remote control this wireless unit performs well. The Falcon Pro 3-button transmitter. The CM2400 comes with two blowers standard. Add up to two more blowers for a total of four. Instead of multiple blowers you can upgrade the CM2400 with a 5 horse power blower Known to have life spans of 10 years, this blower/pump does not lose air around the fan blades. This provides a substantial air boost. You can double the hopper capacity (depending on trailer/truck height) with an extension. Go from 15 cubic feet with option to go up to 40 cubic feet.Increases hopper capacity for 8 bags of cellulose or 1.5 bags of fiberglass. The CM2400 is very capable of wall and glue spray Components include hoses spray nozzles pump, water tank and wall scrubber. 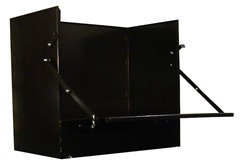 Our standard 34 wall mounted hose reel holds up to 150 of 3 hose or 200 of 2 1/2 hose.